I have been working on and off in Palmer Ak for over 2 years and completely fell in love with the area. I loved it so much, in April 2017, I purchased this great little cabin at the base of Hatcher Pass so that I can come up when I'm not working and Enjoy everything the area has to offer. This Beautiful Cabin was built in 1955; four years before Alaska became a State. Located right at the base of Hatcher Pass. 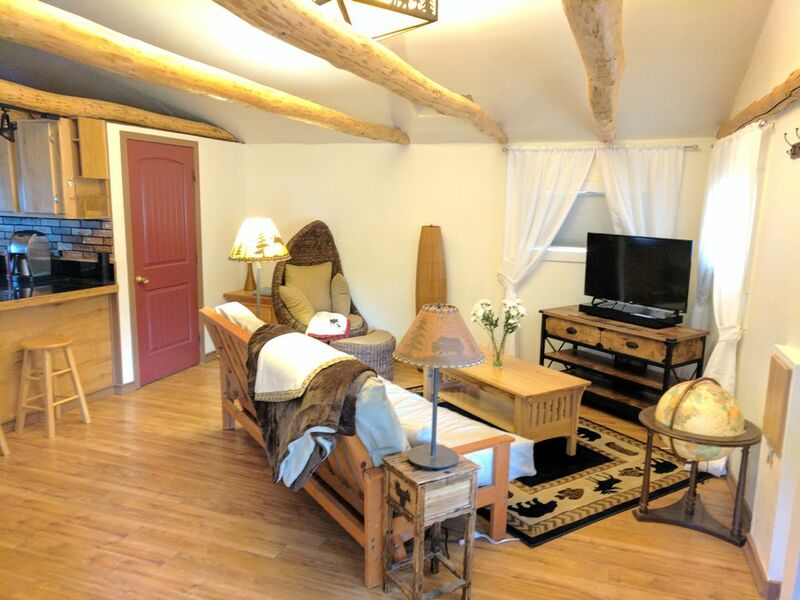 It has 1 Large Bedroom with 2 Queen Birch Tree Beds, 1 Medium Sized Bedroom with a Queen Log Bed and a large Queen Futon in the Living Room, Full Kitchen with large stainless refrigerator and new stainless gas stove/oven, 1 Full Bath, and Free use Washer/Dryer in the Garage. There is 1/2 acre of completely fenced in back yard for your pets and all the space you need at over 1000 square feet. Since I purchased the Cabin I have been spending my vacation time getting it fixed up and in great "Vacation Worthy" condition. In the time I have had available so far I have replaced the old roof with a New Red Metal Roof, replaced the carpet in the bedrooms and hall with Beautiful Laminate Wood flooring, Re paneled the closets, Painted some of the interior trim and doors, installed additional lighting, Competely Re-plumbed the entire house (new water heater, pressure tank, filter, and new water lines), Added a large sized Washer and Dryer in the Garage and Added a new Front Deck with Grill. I have also fully furnished it with brand new Queen Memory Foam Mattresses with New Plush Crazy Comfy Comforters, Beautiful Local Hand Crafted Headboards, Dressers, Log Bed and Kitchen table, as well as a added a Pluthera of Items sourced locally through Craigs List. Beautiful Full kitchen stocked with everything you need. Roku TV with active Netflx, Amazon and Hulu accounts. Receives 12 clear over the air Channels. Netflux, Amazon and Hulu active accounts. Large fully fenced back yard. Super cozy and inviting cabin! The property is beautifully decorated and has everything you need and lots of great extras. It was very clean and the beds were incredibly comfortable. Great place,Clean and well thought out. Relaxing, a nice place to get away from bright city lights! Great location and the coziest comforters ever! Located at the base of the road up to Hatcher Pass made for an ideal location to base out of while teaching an avalanche course. We were six skiers with lots of gear and the warm garage allowed us space to de-rig and re-rig our gear every day. Thanks for a great cozy retreat space! Scott, was wonderful to work with and we had a great visit. The home was ideally located between Wasilla and Palmer . Will return someday we hope. Great location, close to Hatcher’s pass. 15 minutes from the nearest hospital and downtown Wasilla and Palmer. Gas station and small grocery/liquor store right around the corner. As owners of our own rentals ourselves, our group was very pleased and happy with the Hatcher House! From it's comfy beds, spacious kitchen, hot shower, charming decor to its excellent location for those who love the outdoors to the local trails and popular visitor spots. Our family and friends were very comfortable here, it's warm interior made us feel right at home, cooking our own meals, playing board games after dinner and enjoying the internet/wifi/alexa system for music and late night movies. This location is perfect for day trips up to Hatchers, and even though it is conveniently right off the side of the road, it was very quiet and peaceful. A big shout out to Scott for creating such a wonderful place to stay for Alaskans and all of our visitors. You can count on us coming back! Thank you!